And welcome to day 2 of the BLOG TAKEOVER! Jennifer is away on (hopefully!) amazing and carefree vacation, and I (Samantha), have taken over the blog! There's an awesome discount going on - check it out! I'm giving a stamp set away today (and Tuesday...and Thursday...) to one of you! Just leave a comment telling me your favorite birthday related memory! Ok, on to my card! Did you laugh, perhaps a little? I'll even take a token smile! 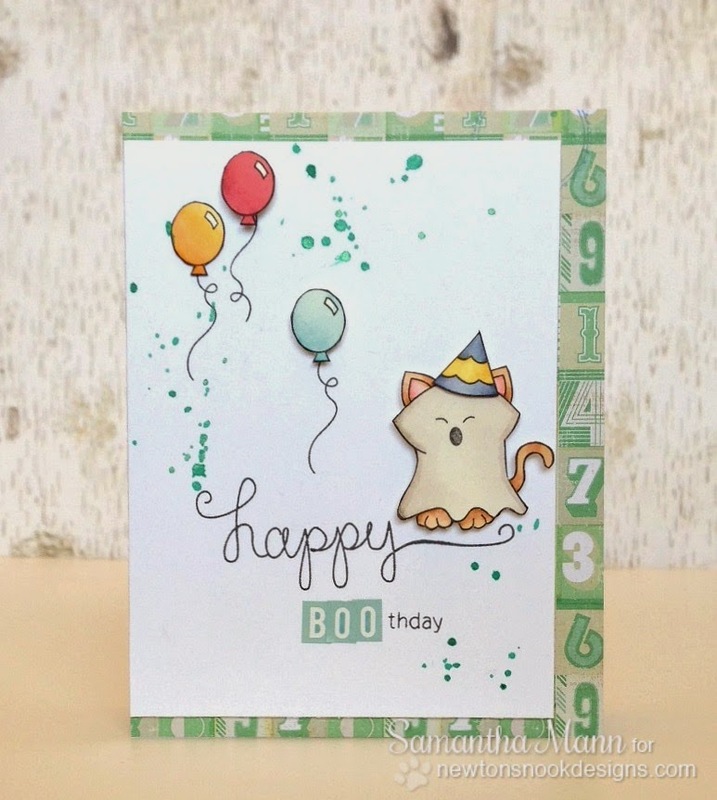 I used three different stamp sets for this card: Winston's Birthday (balloons! ), Boo Crew (Winston as a ghost!) and Simply Sentimental (part of the sentiment)! I made this for a specific little birthday boy who LOVES ghosts (and even had a ghost themed birthday party!). All of the images were watercolored with distress markers! Make sure you comment on the blog posts all week, for your chance to win! What's better than a little mid-week giveaway when the boss is out of town?! Ha! Very cute and perfect for this ghost loving boy. Favorite birthday memory is the surprise 50th birthday party my church stamping group held for me. Super cute card!!! My favorite bday memory is when I got a car for my 16th birthday!! Cute images. My favorite memory is my 50th b'day. My hubby wrapped an old sweater and I am thinking WHAT? Under the old sweater I found a diamond eternity ring. got home! Really cute and fun. A BD memory...at work the girls asked me what kind of cake I wanted for my 50th BD, I said please don't get me a cake, just a cupcake would be fine. I came in the office next morning and their were 50 cupcakes spread over my entire desk..I just stood there and laughed. Cute card...love the splatters! My birthday is in late May, so all during school/college it was so hard to celebrate with finals or school being out for the summer. So, my favorite memory is flying to Vegas for the weekend with friends after all of that school stuff was finally out of the way. One of my favourite birthday memories was my 16th birthday - that's a LONG time ago! My then boyfriend took me out to dinner - to a real restaurant (not fast food) and said I could order anything I wanted. So I went for it - the seafood platter! It was the best seafood platter I've ever had - even to this day! Such a darling card! I can't wait to take out my NN's Halloween critters; one of my favourite sets!! Your blog-take over is too much fun! Best memory: I don't answer the door at home when I'm alone. Call me chicken, but you never know who's on the other side! Anyway, on my 50th birthday - 4 years ago - i was on the phone, chatting with my brother, who was on his cell, when the doorbelll rang. I commented that it had, and 'no way' was I opening the door on a cold winter's night. We carried on talking; door bell rang again...I remarked that some 'annoying person' wasn't getting the message and I just wanted who ever it was to go away. At that point, my brother says, "Answer the flippin' door!" - I did - and to my shock, delight and embarrassment, there he was, with my very pregnant at the time sister-in-law, having driven four hours in the middle of winter to bring me a "Happy 50th Birthday" surprise. I still don't answer the door at night...but this episode is etched in my memory. Best. B-Day EVER!!! Super sweet card love it!!!! This is adorable! I love that someone is into ghosts. :) Too precious. I'm in love with the design of this card! Adding another set to my wish list now! Favorite birthday memory was in third grade my mom surprised me with a pink cake in my classroom! Darling card! 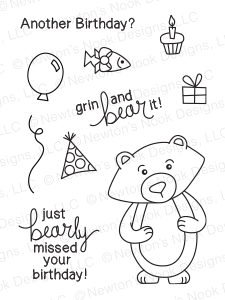 Love all the fun Newton stamps that are available! My birthday was yesterday (26th) so that's my best memory (also the easiest). The kids took me out for supper. Got some presents. Lots of friends wished me happy birthday on FB. The little card is darling. Too, too cute! 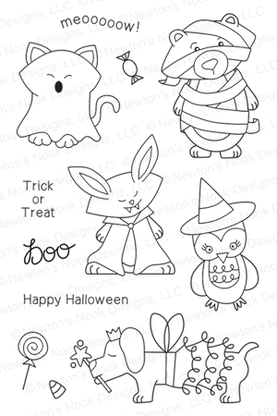 I need these Halloween stamps! My favorite b-day memory was closing on our house on my b-day! Is was the biggest present I ever received! 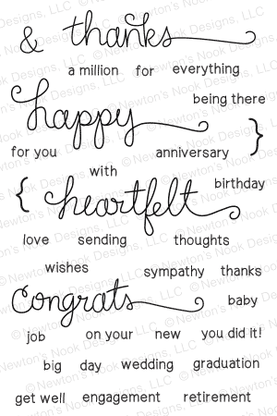 Such a cute card! My favorite birthday memory was my 8th birthday--it was my first big party! What a cute Boo-Day card. Love it. My best birthday was in 1969 as I got engaged to my wonderful hubby on that day. Sweet, sweet card!!! The little critter in the party hat is so fun!! My favorite BD memory is a treasure hunt that my college roommate and my BF at the time (and now my hubby of 33 years!) threw for me. They contrived to lay clues all over our little college town, including a note taped to a gravestone, and a note inside a book at the local bookstore. It culminated with a cake and ice cream with our friends. Very fun!!! Thanks so much for the chances to win this week!!! All of my birthdays have been memorable! I always feel loved by my family! Awwww, I love birthdays...especially mine! Favorite memory would probably be my childhood birthday parties when my Mom always centered the festivities around crafts..yay! One year we all decorated these little canvas tote bags and stamped designs onto them. Then we filled them with candy and party favors. My favorite birthday memory was the party that my daughter threw for my grand-daughter's 1st birthday 3 years ago. What a great time was had by all! We decorated cupcakes with owl designs, blew up giant beachballs for kids to chase all over the backyard and even had a pretend tattoo parlor with temporary tattoos of course!